After becoming the first Filipino American to win the Food Network’s Chopped, Charleen Caabay returns to Oakland with a new restaurant and a higher purpose. In 2007, Charleen Caabay drafted a contract with herself. In five years, she’d launch her culinary career with a food truck, restaurant, catering company, or some other serious endeavor. It took her only four. In 2013, she opened Kainbigan in East Oakland, exposing locals to the stewed, comforting wonders of Filipino food. 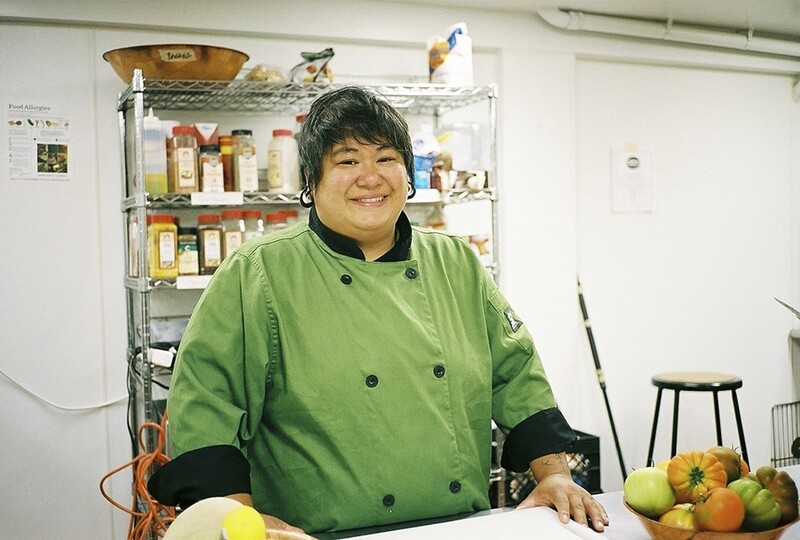 Kainbigan achieved widespread acclaim, getting Caabay booked as a featured chef for high-profile events and, eventually, a spot on Food Network’s Chopped. She became the first Filipino American to win the show. The December episode marked a turning point in Caabay’s career. She closed Kainbigan, traveled to the Philippines, and returned to find real estate agents offering her restaurant locations. “It was literally a start-from-the-bottom, now-I’m-here type thing,” she said, sitting in her new restaurant, Craft & Spoon, in Oakland’s Uptown. Caabay was born in New Jersey and moved to Vallejo in junior high, bouncing all over the East Bay until she settled in Oakland after graduating from DeVry University. She studied IT but entered the workforce when tech jobs were in a sharp decline. All she could nab were short contract jobs, and after repeatedly finding herself unemployed, she turned to her passion: feeding people. Caabay never formally trained as a chef, instead picking up skills from her grandmother, mother, and older sister. Food is a huge part of Filipino culture, and it was always around. Among her friends, she was the one who’d rummage through kitchens to figure out what to eat after school. And her house was the go-to, always stocked with adobo chicken, baked chicken, broiled chicken, coconut chicken — it’s how she got her enduring nickname, Chikun. At a bar one night, Caabay met Christine De La Rosa, an event promoter who would eventually become one of her business partners and closest friends. Caabay dazzled De La Rosa with her cooking and quickly scored invites to serve food at different club events. For about six years, she worked the underground, doing pop-ups wherever she could and serving late-night revelers a mix of tacos, burgers, and Filipino classics. That’s where Caabay first developed her reputation, and it’s where she still draws much of her support. It’s why Caabay and her all-queer partners with Craft & Spoon — De La Rosa, Aima Paule, and Michael Schlieke — specifically wanted to staff the restaurant with queer folks. Caabay noticed on social media a constant stream of people from the local queer community in need of work. In addition to Craft & Spoon, Caabay and her crew own Town Biz and Benefit Health Collective. Caabay also has a spot lined up on San Pablo Avenue — she’s still not sure if it’ll become a restaurant or something else — and a third location in the works. Caabay says queer and trans people face discrimination in the restaurant industry. At Craft & Spoon, the queer community already comes in droves. The drag show has been softening the lines between genders for nearly a decade. Places like the Queer Gym and Radically Fit cater to LGBTQ+ individuals who want to avoid the hyper-masculine, body-shaming nature of traditional gyms. At Beauty Botanica in downtown Oakland, Olivia Bianco-Chaidez transforms hair — and more — for a mostly Brown and Black LGBTQ clientele.